Following the success of its 2017 homecoming festival, Maftown Heights returns to Mahikeng with the likes of Kwesta, Nasty C and Khuli Chana set to take centre stage. 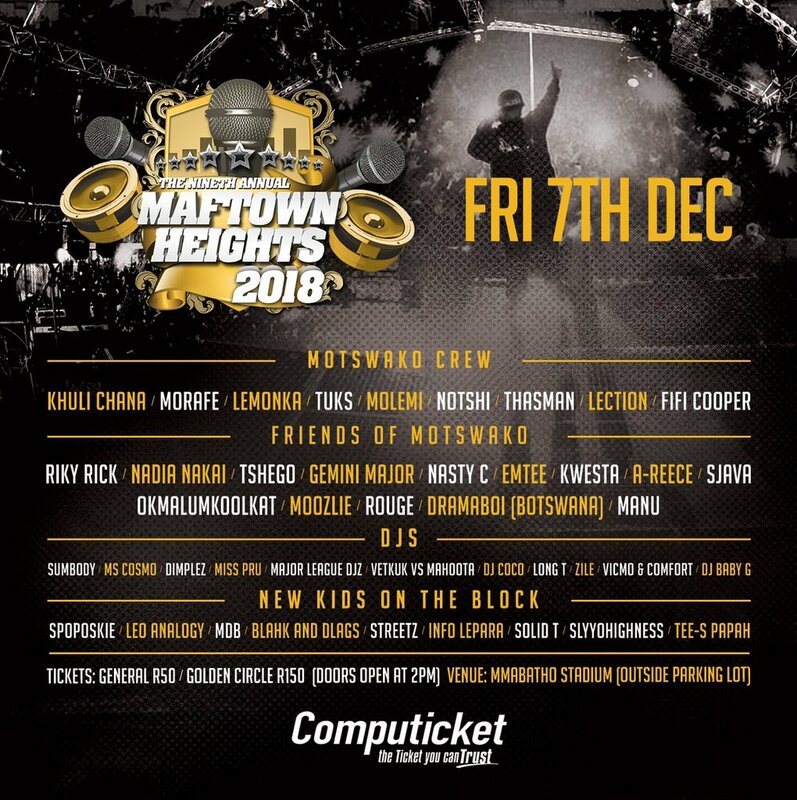 Friday, 7 December 2018, will see the popular Maftown Heights music festival return to the Mmabatho stadium in Mahikeng, after a successful run in 2017. The music festival seeks to celebrate and promote hip-hop music, particularly Motswako hip-hop. This year marks the ninth edition of the festival, which was initially hosted in Johannesburg, but since 2017, has been hosted in Mahikeng, which is often cited as the birth place of Motswako hip-hop. Organisers of the festival have revealed a star-studded line-up, with the likes of festival co-founder, Khuli Chana, Nasty C, Nadia Nakai, Kwesta, Sjava and Gemini Major set to take centre stage on the day. DJ Sumbody, Ms Cosmo, Vetkuk Vs Mahoota, Miss Pru, Dimplez and Major League are just some of the DJs that attendees will be treated to. Tickets of the festival are available for purchase from Computicket, retailing from R50. Gates open at 14:00.